HART DOOR SYSTEMS reports it has completed the installation of two Speedor ‘Storms’ at a recently opened packing and distribution facility. 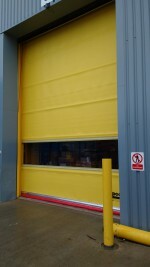 The company says the doors were installed to keep a stable working environment within the 310,000 sq ft fulfilment centre in Dunstable. Mark Richardson, sales manager, said the Speedor ‘Storm’ variant of Hart’s leading high-speed door range was a popular choice where exceptional wind resistance over 90 mph, was required.